Interviewed on 3rd February 2003, at his self-built home in Cooks Road. An obituary follows. Ray Eyres was born in Willesden, London, and went to school there; he had a brother, 11 months older, and a sister. His mother (née Pamela Gould) was born in Elmswell and went to school here, but she died when Ray was only 2 years old. So Ray was electrician by trade, and went to work at the Bacon Factory before the war, as a fitter and electrician, eventually spending 38 years with the firm. “They didn’t electrocute pigs, just hang them up by the back legs and stick them with a knife; you could hear the pigs screaming all day long. Later they had an electrical stunner, which was more humane.” (Shows me a leaflet on the Bacon Factory). He tried to volunteer in 1940, going to the office in Ipswich 3 times, but when he told them he worked in a bacon factory they said “It’s a reserved Occupation, you’re doing more good there!” and wouldn’t take him on. Eventually they did take him on, at the 4th time of asking, in 1941. Ray showed me his medals in a frame on the wall, and a reunion photo standing next to a spitfire (in the 1980’s?). The Bacon Factory paid him 5s/week retainer through the 5 years, but afterwards he didn’t really want to go back to it. He spent 2½ years in Belgium, came back and built a house (see below), and then went to the Labour Exchange, who said the Bacon Factory had been asking after him. So back he went. Many years later they hired another electrician and after a year Ray found this guy was getting more money because he was in the union. The foreman refused to up Ray’s pay, so he went and joined the EEPTU too, but when he confronted the foreman again, they fired him! So he went and worked at the West Suffolk Hospital for the last six years of his working life. In his long years of retirement Ray was often to be seen tending his garden, even until a few days before his death at the age of almost 93. He was in the RAF five years 1941-6 (see separate note), and when he returned (after 2½ years living in Belgium, so about 1949) he asked his uncle, Walter Gould, to teach him to lay bricks, so he could build himself a house. He says: “What do you want to learn labouring for, you’re an electrician! I’ll teach you what you want but on one condition: you do it my way and you do what you’re bloody-well told!” He went round with uncle for 6 months as a jobbing builder at weekends, labouring first, learning how to mix, then laying. “You’ll do, but I want a decent job since my reputation’s at stake”. He found and bought the piece of land (where he lives now); it cleaned him out down to £36 in the PO. A friend at the Bacon Factory was an expert on roofs, and he got a plasterer in. He had cast iron window frames, with concrete sills and lintels. Fifty-odd years later his smart bungalow on Cooks Road is a lasting testimony to Ray’s enterprise. He had been a cub in London, then in the scouts with brother Bill. They used to go camping near Lowestoft, Corton, for a fortnight every year, carted by furniture lorry; when they were washed out they had to sleep in the barn with rats running around. Coming to Elmswell a Mr Henderson, an accountant at the Bacon Factory, was the scoutmaster at that time. Rover scouts used to have the long building that runs along New Road (the shed that can be seen on some old photos). Ray was one of the stalwart band which built the Memorial Hall in Cooks Road, as recorded elsewhere. He was also one-time secretary and treasurer of British Legion in Elmswell, and served in such positions for the Football and Cricket clubs. 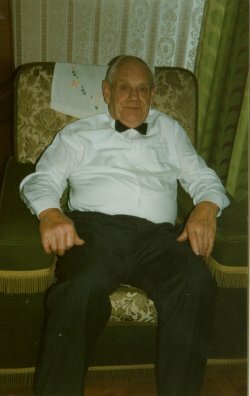 Grandparents: His grandmother lived in a thatched house in Hawk End lane, and raised ten children. Aunt Rose Gould was unmarried, but had a child (“caught on one leg by the butler, I think!”). Two uncles (Charles and Frederick Gould) died in WWI. Walter Gould survived, and became a master bricklayer, living in New Road (next door but one to Andersons/New Road Engineering). He used to work as a bricklayer for Herbert Mulley; he built every one of the bungalows in Prescott Drive, and Baker’s house (Millstones); he did quite a lot of building for Mr. Baker. Grandmother was buried by the Parish under the poor laws, down at the bottom end of the cemetery. Rose and Walter are also buried there. There are no more Goulds in the village now. Mr Elliston grew barley every year on the field (The Pightle) next to the old school and church hall; also kept pigs. Walter Hawes the printer: we used to supply him with electricity for the presses at the time, and I serviced the electric motors – they had had foot-treadle machines previously. Jim took over, father of the last one that had it (David). Farrows: Bill was keen on the Bowling Club; Porky, his brother used to live opposite here, I found him dead in his chair one day – he was getting on a bit. They were born in that house on Wetherden Road, not the bungalows. Bill Armstrong was another of those who helped to build the hall, and he later served for a time as Chairman of the Parish Council. Stan King was born next door to where I used to live in Hawk End Lane; I remember his mother (May) and grandad (Jack). Railway: there was a goods shed and a couple of goods sidings; pigs were delivered by rail, and goods for all the surrounding villages. There were two shunting horses, with stables where they’re building them flats now (south of the platform, 2003); two shunters (employees) each having a horse boy to lead the horse; the shunter worked the brake on the truck behind; sometimes they bumped the horse’s arse (not hard, mind). They had a chock bar: about this long, 2″ square at one end and round handle at the back end, and they used to jam it in the brake and heave it down to stop the waggon from running away. One siding was this side where Jewers’ office was; the other where the goods shed was, now part of the industrial estate. A siding went alongside the timber yard and round to the bacon factory. Pye’s timber yard was on the other side of the railway, and the Bacon factory just beyond that. I remember two big fires in the timber yards. The fire engine was the steam-operated pump, a present to Elmswell Fire Brigade from the Westgate Brewery (Greene King). His first marriage failed during the war, but met and married Catherine, a Belgian lady. Catherine came with him from Belgium, with her daughter (Juliette) of 9 or 10. She couldn’t speak English when she came: he gave her a secondary education (this was financial hardship for him), then a hairdressing apprenticeship. But eventually she turned against him, and went back to Belgium. 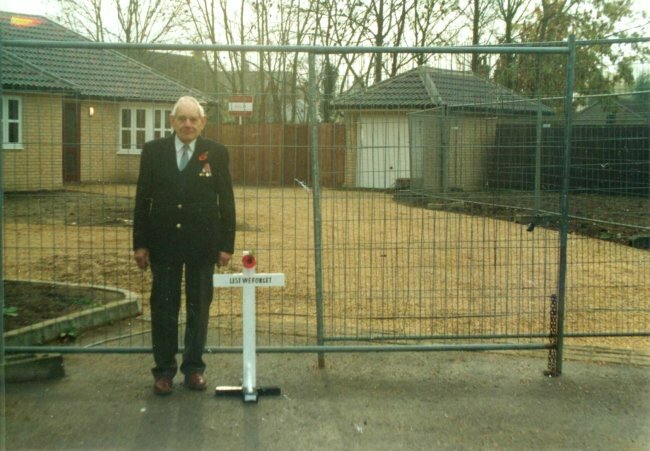 Ray felt so strongly about the demise of the Memorial Hall that when the new close was built on the site he took this WWI-style cross (“Lest we forget”) along for a picture; the cross was still to be seen in his front garden in 2006. Under canvas in RAF, in a tented camp by a wire mesh runway down in Kent (Tenterden). Spitfires in the Battle of Britain. Was with the Canadians 421 Squadron for 2½ years, all over the place – Digby in Lincoln, Kenley next to Purley/Croydon, Redhill, near Worthing. Electrician on aircraft maintenance. Transferred out of 421 Squadron 2 weeks before D-day, finished up in motor transport division of RAF. D-14 with convoy through Allemanche heading for Belgium, following the Allied advance, into Brussels 2 days after they relieved it. They set up a repair camp, collected all manner of wrecks, stripped them down, four lines, and all parts overhauled; the chassis went round and on the way out was rebuilt. Engines were rebored to one standard piston size, a few thou over – anything too big was scrapped. Gen. Montgomery picked up in Italy a caravan on a Fiat chassis; they rebuilt it in Belgium: the dynamo was u/s, so he put CAV windings into the FIAT housing so it could go back on the same mounting, then rewired it and the general took it back into civvy street with him – he believes it is now on display at Duxford. Ray Eyres died suddenly and peacefully on 28 May; he had almost reached the age of 93. As energetic as ever, he continued to work on his beloved garden until a couple of days before Ray would have been proud that, this year, it was looking better than ever Although his mother was a born and bred local girl, Ray was born in London. The middle child of three (he had an older brother and younger sister), it remained a source of great sadness to him that he never properly knew his mother who died when he was two. The family was separated for long periods, Ray spending much of his time in Suffolk with his maternal grandmother, Annie Gould, at her thatched cottage in Hawk End Lane. Elmswell became a permanent home to Ray from the age of 14 and it was clear from any conversation that he felt great love and pride for this village. Ray served an apprenticeship at a local garage. He had a natural ability to mend and modify all things mechanical and an enquiring mind. In the 1930’s the garage used a generator to start an electricity supply to the village. Ray then added the trade of electrician to his other skills. Before World War II, Ray joined the staff at the Bacon Factory as an electrician/fitter and had many colourful stories to tell of the 38 years he spent there. When war broke out, Ray volunteered for active service, but his was a reserved occupation and it was not until 1941 that he was accepted to serve in the Royal Canadian Air Force. Although his skills as a mechanic and electrician were essential to keeping the aircraft flying, Ray always felt that his contribution was little compared to that of the young men who faced daily peril. Fierce respect for those who made the ultimate sacrifice remained with him for the rest of his life. Ray was a good sportsman and it was through Sport that he met his wife during his time stationed in Belgium. Catherine was the sister of one of the Belgian players in an opposing team. He returned to Elmswell in 1949 to build a home for Catherine and her daughter Juliette. He bought a plot of land on the corner of Cross Street and Cooks Road and, with the advice of friends and relatives, built Edelweiss, the home he lived in until his death. But Ray never forgot the young men who did not return from that war. With other local people, he helped to construct the Memorial Hall which stood on the site next to the library, with the intention that it would become a permanent war memorial to the fallen. But times move on and Ray’s memories and conviction remained clearer and stronger than most. In the late 1990’s following the construction of the Blackbourne, the decision was taken to demolish the Memorial Hall and to sell the land for development. Ray felt deeply hurt by this decision and for the next ten years, his impassioned letters became a regular feature of the Elmswell Newsletter. Latterly Ray accepted the razing of the Hall and had turned his energies to the building of a conventional war memorial on the land once occupied by the building. He felt strongly that money raised from developing the land should be used for this. Ray was a strong and colourful character who never minced his words and usually ‘shot from the hip’. He had few skills as a politician, diplomat and tactician, but his integrity and honesty remains a shining beacon. In the front garden of Edelweiss Ray displayed a cross bearing the words ‘Lest we forget’. The following is a reading from his funeral Service written by his niece Sheila Watson. And enjoy a freedom that they had to forego? Demonstrating a patriotism not dulled by time? His independence, his love of home and country. And let us not forget! Sleep peacefully Ray, and may all your dreams be of gardens and war memorials!